A method of modifying an internal combustion engine to run on electrical energy. A conventional cylinder head cover of the internal combustion engine is removed and a steel plunger is secured to an end face of each one of the associated pistons. The conventional cylinder head cover is replaced with a modified cylinder head cover which has a solenoid located within each one of the extended cylinder bores, and each solenoid has a central bore for receiving the associated steel plunger. Each solenoid is coupled to a control unit which provides electrical power to each of the solenoids during approximately 180 DEG of rotation of the crankshaft of the engine. The control unit may be a mechanical distributor and relay arrangement or an electronic controller. 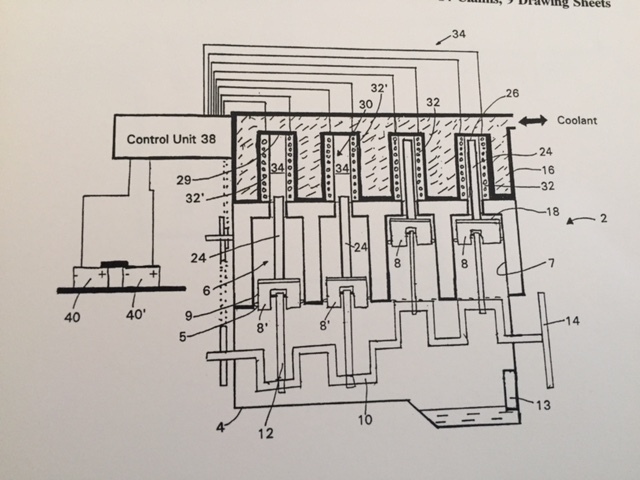 The pistons work in pairs so that when two of the solenoids are energized, they draw the associated steel plungers within the solenoid central bores while the two remaining solenoids remain de-energized and rotate or reciprocate solely, due to their momentum, to a lower most position. Once the two pistons, associated with the energized solenoids, reach their upper most rotational or reciprocal position, the associated solenoids are de-energized and the other two solenoids are energized. The sequential energization/de-energization of the first and second pairs of solenoids causes the crankshaft to rotate in a desired direction and provide driving output in a conventional manner. The cylinder head cover is provided with an internal coolant cooling system for cooling the solenoids, during operation of the engine, to prevent overheating thereof. 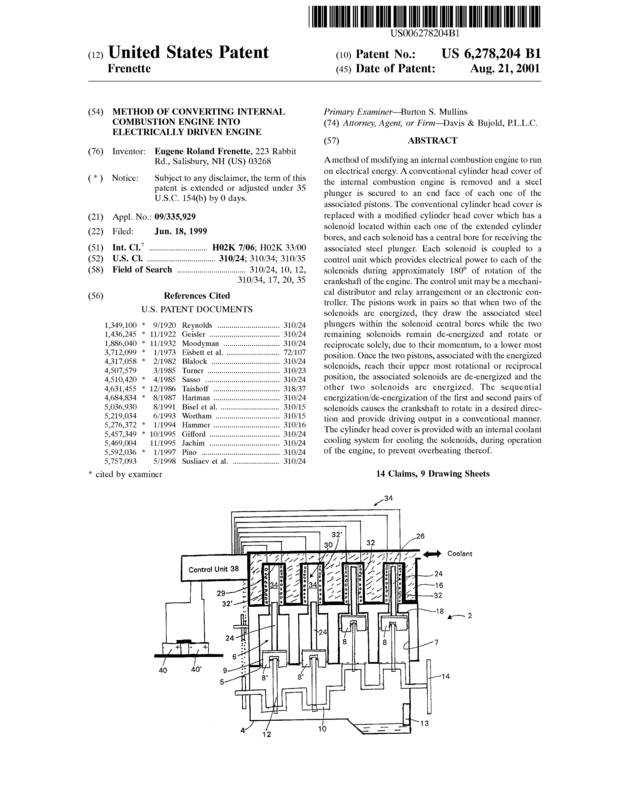 Page created at 2019-04-23 6:11:05, Patent Auction Time.